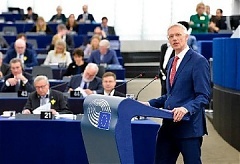 Latvian Prime Minister Krišjānis Kariņš debated the future of Europe with MEPs and Commission President Jean-Claude Juncker on Wednesday, 17 April. In his address to MEPs, Prime Minister K. Kariņš pointed out that the EU is a union based on values of freedom, democracy and the rule of law. Model design experts from Estonia and abroad will take part in the largest BIMSummit 2019 digital construction conference in Estonia taking place for the third time. The conference will introduce BIM projects with innovative solutions from Estonia and other countries. Data from Statistics Estonia show that consumer prices were 2.3% higher in March than a year earlier. Inflation has been slowed in recent months by the price level of electricity, which fell 11% in two months. At the same time, inflation has been pushed up by prices for motor fuels, which have risen by 6% in the same months. Why do pensioners live in poverty and hospital beds remain empty? Lithuania’s expenditure on general public services is one of the lowest in the European Union (EU). Looking beyond the notable differences in the level of expenditure, what stands in marked contrast to other EU countries is also the untapped potential for more efficient allocation of funds. European Union (EU) institutions are finalising the Mobility Package – a set of initiatives concerning the governance of commercial road transport in the European Union that would make traffic safer, ensure proper social conditions for workers, support fair competition, increase efficiency and reduce CO2 emissions, air pollution and congestion. However, without any prior preparation, in the long run the new rules might cause financial problems for the currently booming Lithuania’s transportation sector, which generates more than a tenth of the country’s GDP. According to data published by the Central Statistical Bureau, the average gross wage for full-time job grew by 8.4%, reaching 1004 euro in Latvia in 2018, and is close to the forecasts of the Macroeconomic Developments Report of December. In 2018, all three Baltic States – Estonia, Latvia and Lithuania - celebrated the centenary of their founding. For half of this period, from 1940 to 1990, these countries were incorporated against their will into the Soviet Union. In 1990 they democratically proclaimed the restoration of their independence, which was widely internationally recognised in 1991. In these new circumstances, on November 8, 1991, the Baltic Assembly was officially established as the inter-parliamentary cooperation organisation of the Baltic States. It was based on the close co-operation forged between the three Baltic nations’ independence movements in the 1980s. Nord Stream 2 – JUST a business project? Editor of The Baltic Course Olga Pavuk discusses the controversial pipeline with Romans Baumanis, a Senior Advisor to the company. The Baltic Sea is unique. It is a lifeline to nine coastal states. It provides access to the Atlantic Ocean. Our history has taught us lessons that are still useful. Economic cooperation has been and continues to be a necessity. The Sea is an important – and controversial – energy route. The Sea itself has a fragile marine ecosystem worth for protecting. In 2018, economic growth in Latvia exceeded the initial estimates. Growth was supported both by expanding investment activity and one-off developments; meanwhile, some risks did not materialise to a full extent. Although investment activity is clearly evident in the two-digit surge in construction last year, the economic growth can be viewed as balanced since a wide range of sectors developed successfully.